Dentistry is really expensive these days, and RVers that make their way south in the wintertime can take advantage of the good quality dental care that is available just over the border in Mexico. 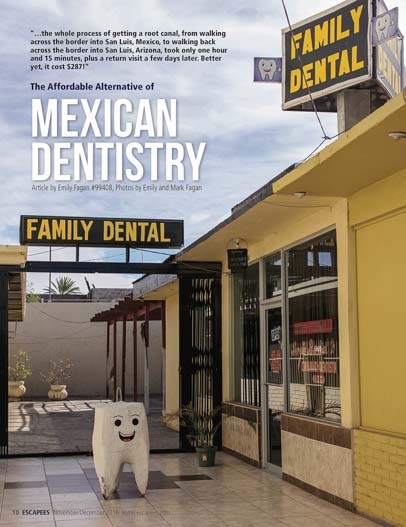 The November/December 2016 issue of Escapees Magazine features our article about some of the great experiences we have had with dentists in Mexico just across the border from Yuma, Arizona, in San Luis Rio Colorado, Mexico. Our dentist, Dr. Sergio Bernal, is a general practitioner in San Luis Rio Colorado just over the border from San Luis, Arizona (south of Yuma). Last year he coordinated and oversaw a root canal I had done in a tooth that already had a crown on it (described in detail here). Eight years ago, Dr. Bernal put a porcelain crown on a baby tooth of Mark’s that had never fallen out. It was an exccellent crown and very easy procedure. The crown was fabricated by the lab and ready to be installed within 18 hours of us arriving at Dr. Bernal’s office for the very first time. It fit perfectly and cost just $130. Mark always said it was the best crown in his mouth. Unfortunately, the baby tooth under this crown came loose this past October, and Mark was suddenly in a lot of pain. He needed another solution. Ironically, this happened just as the issue of Escapees Magazine with our article about Mexican dental care was being mailed out to Escapees members. Because we lived on our sailboat in Mexico for the better part of four years, we have enjoyed top notch dental care all over Mexico, from the Arizona border to the beautiful Bays of Huatulco very near the Guatemala border. We have always been very satisfied with both the dental care and the price. 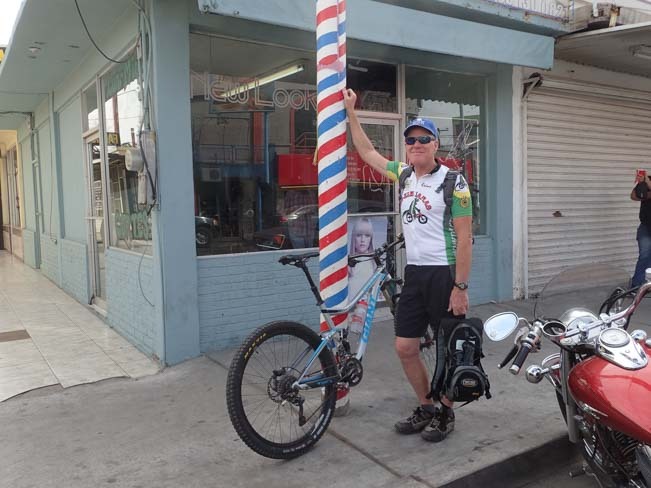 With Mark’s tooth aching, we dashed to Yuma and then zipped across the border from San Luis, Arizona, to San Luis, Mexico, on our bikes (you can learn more about doing this as well as walking over the border in our blog post about Mexican dental care here). Even though dental care in Mexico is excellent, the upscale frills that Americans are accustomed to are not necessarily a part of the deal. For starters, dentistry in Mexico is usually handled on a walk-in basis rather than making an appointment in advance. Some people have read my writings about dentists in Mexico and have tried to find these dentists on the internet. Well, most Mexican dentists don’t bother with the expense of setting up a website, as they rely more on word of mouth and patients showing up at the door when they need care. So, we got psyched up for a day of dentistry, rode the 1/2 block from the border to Dr. Bernal’s office, leaned our bikes against the wall and peered in the door. Unfortunately, he wasn’t there. Rather than wait, we decided to ride over to visit the endodontist, Dr. Horacio Avila, who had done such an excellent job on my root canal last year. I needed to see him for a follow-up on my root canal anyway, and we figured he might have some thoughts about Mark’s aching baby tooth. We each took a quick turn in his dentist’s chair and looked at our x-rays with him on his computer screen on the wall. My root canal was doing great, but Mark’s situation was more complex. The adult tooth was present but was lying sideways, which meant there was no option for an implant. Instead, Dr. Avila felt he probably needed a bridge. Mark and Dr. Avila check out his tooth on an x-ray. Being an endontontist and not a general practice dentist, bridges are not his line of work. So, he handed us the x-rays and sent us on our way. The bill for our five x-rays at Dr. Avila’s office was $50. We biked back to Dr. Bernal’s office and found he had returned from his errands and was happy to see us. 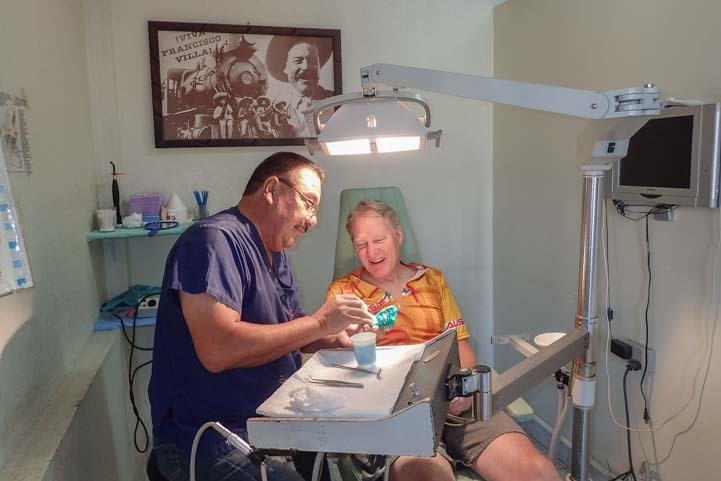 Mark got in his dentist chair, and Dr. Bernal had a look at his tooth and Dr. Avila’s x-rays. Of course, Dr. Bernal has an x-ray machine too, but there was no need to duplicate the x-rays. He agreed that an implant was out and that a bridge was probably the best way to go. He pulled Mark’s tiny baby tooth out of his mouth with a quick yank and explained that a bridge involves grinding down the two adjacent teeth, putting crowns on them, and then suspending a false tooth in between. Egads!! Sadly, the two teeth on either side of Mark’s (now absent) baby tooth were 100% healthy. Mark felt really badly about grinding those teeth down to support two crowns and suspend a false tooth in between. Dr. Bernal scratched his head for a while and studied Mark’s teeth for a while and then suggested he consider a different option: grinding a tiny channel on the back side of each of the two healthy teeth and suspending a false tooth in between on wings that were inserted and glued into the channels. He suggested that Mark try a temporary solution like that and see how it felt before committing to a permanent solution. So, we hung around San Luis for about three hours while Dr. Bernal’s lab technician across the street fabricated a plastic temporary tooth. In the middle of the afternoon, Dr. Bernal inserted it and off we went back over the border. He charged us $20 total for all of his work and the lab’s work. Dr. Bernal goes over Mark’s options with him. Mark liked the idea of being able to keep his healthy teeth mostly intact and not crown them, so we returned a few weeks later to get the permanent work done. Again, we showed up unannounced around 8:00 in the morning, and by late afternoon Dr. Bernal’s technician had fabricated a permanent false tooth with wings and Dr. Bernal had prepped Mark’s teeth and installed it. Mark absolutely loves this tooth. He’s had it for a few months now and doesn’t even notice it’s there. It chews fine, looks fine, and the teeth on either side of it are totally intact except for a tiny indent in each one to support the wings of the false tooth. A retired dentist friend of ours said similar dental work in the US would have cost over $1,000. Besides the high quality workmanship and low cost, the best thing about all of this was the back-and-forth conversation we were able to have with Dr. Bernal. Rather than the brusque manner of many dentists, he took the time to consider other options besides a bridge and to listen to our concerns about destroying two perfectly good teeth. 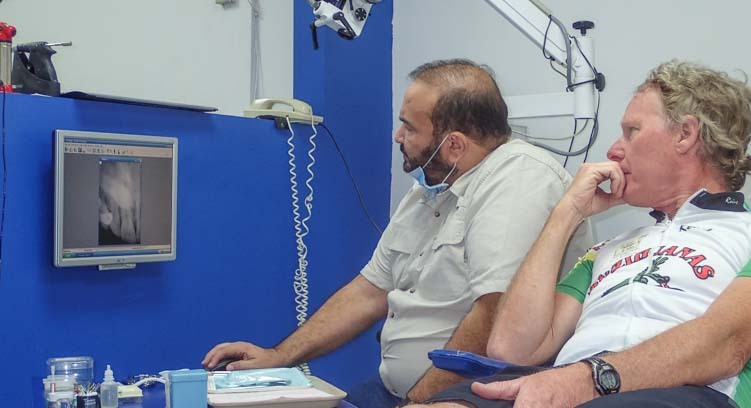 I was in the room with Mark the whole time, and I liked the feeling that we were participants in Mark’s dental care rather than being just recipients. Next door to Dr. Bernal’s office there is a hair cutting salon. 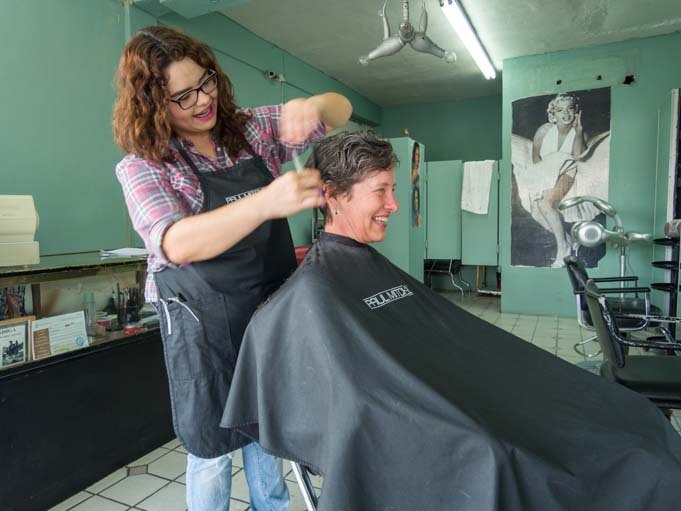 Both times we visited Dr. Bernal, we dropped in on the hair cutting salon to get haircuts. The most delightful stylist named Amber works there, and for just $3 for men and $5 for women, she does a great job. To find her shop: as you walk into the alcove where Dr. Bernal’s office is, the hair salon is on the right side before his office. For both of us, these have been the bests haircut we’ve had in over a year! Next to Dr. Bernal’s office there is a great little hair cutting place. 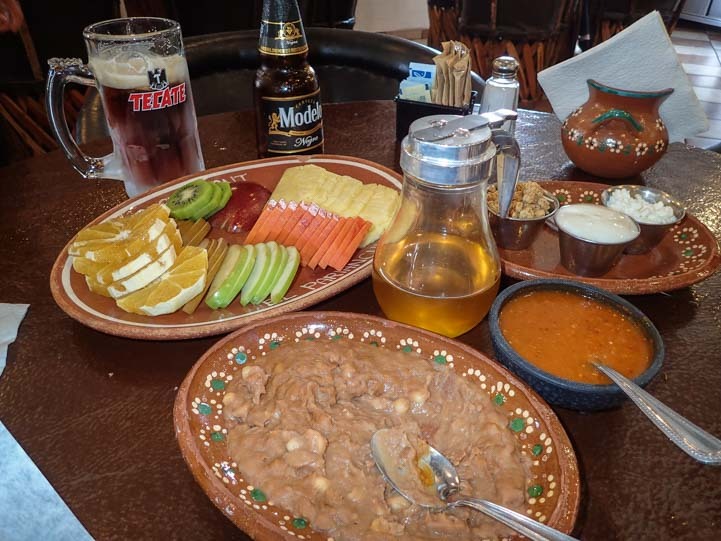 Another thing that’s great about going to Mexico for dental care — besides receiving excellent care at a fraction of American prices — is that it’s an excuse to enjoy a daytrip to another culture and eat some really wonderful Mexican food. In San Luis there is an absolutely fantastic restaurant called El Parianchi that serves incredible food, complete with fun entertainment. We’ve now eaten several lunches there and a breakfast too, and we have loved the experience every single time. The first course of a feast for two for $13 (pancakes and omelette not shown) at El Parianchi restaurant. We’ve gotten to know several of the waiters as well as the harpist, Elias. 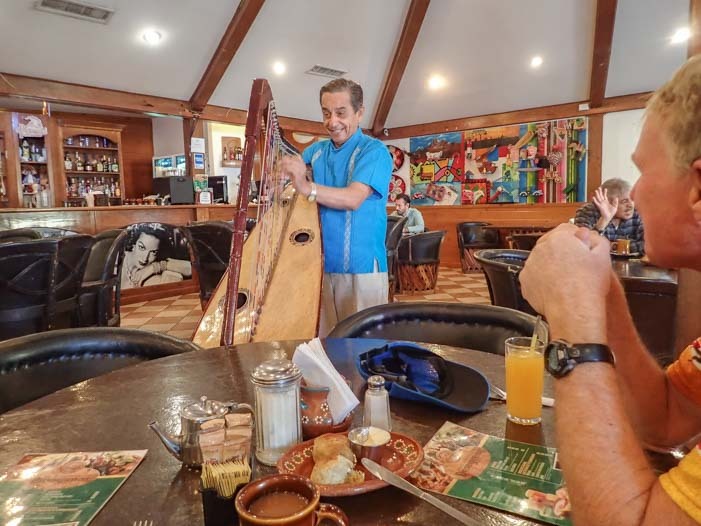 Mexicans enjoy listening to folk songs played by various kinds of musicians while dining, and the harp music adds a special something to the ambiance at El Parianchi. Elias entertains us with his harp. El Parianchi also has a stash of huge sombreros, and sometimes the waiters bring them out and put them on their guests as a gag. We ended up wearing these crazy hats on one of our visits for my root canal last year (see this post). On one of our visits this year, a group celebrating a 26th birthday ended up in the hats right behind us! Sombreros for everyone at the birthday party! When we crossed the border for our first visit with Dr. Bernal this past October, we were alarmed to see a huge group of illegal immigrants waiting to cross into the US. On our return visit a month later, Mexican authorities had removed them from the sidewalks and placed them in shelters. The sidewalks near the border were empty as they always had been before. So how do you get hooked up with a good dentist in Mexico? We first heard about Dr. Bernal from fellow Escapees members at the Escapees Kofa RV Park in Yuma. 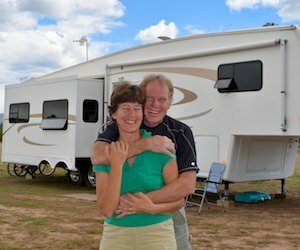 For new RVers, we highly recommend joining Escapees RV Club, as it is little tidbits like getting the name and address of a trusted Mexican dentist that are the unsung benefits of being part of this club. Escapees is known for its fabulous magazine, its many member parks, its discounts on RV parks across the country, its workcamping job board, its massive database of boondocking locations, its bootcamp training for new RVers and its incredible mail forwarding service and RV advocacy work. But sometimes it is the little things that are passed on member to member, like dentist and doctor referrals, that make the club particularly helpful for folks living on the road in their RV. Lots of people go RVing, but there is a comaraderie among Escapees members that is unique. We’ve been members since 2008!! This entry was posted in Arizona and tagged Arizona, Arizona Southwest, Full-time RV Lifestyle, New, Non-Travel, USA by Roads Less Traveled. Bookmark the permalink. We might just head down that way for our dental work this year since our new health insurance plan doesn’t cover dental – or anything for that matter, but that’s another story. Anway, thanks for the referrals and recommendations! Mark, I had three baby teeth that never came out, but they also had no adult teeth behind them. When I got braces about 13 years ago, two had already come out and I had the third one removed. Two of the spaces closed up but I still have a missing tooth. Every time I go to the dentist, they ask if I’ve considered implants. Well, yaaaaaas. But I’ve been told that they’d have to take bone from my hip to do it because there’s not enough bone there now. I don’t like that idea too much and I’ve also resisted the bridge for the same reason as you. Years ago, a dentist tried a different approach but it didn’t work. Now I’m thinking that maybe your dentist can close that gap for me! Thanks for a great story. We’ll be in the Phoenix area January 17-April 13. Hope to catch up with you if you are also in the area! Wishing you a happy, healthy new year. Wow, that’s quite a story, Donna. Maybe Dr. Bernal could help you out. I hope we see you sometime this spring. Have fun in San Diego! There’s much more detail about both of these dentists, where they are, and other dentists we’ve been to in Mexico at this link. We do love adventure and I’m glad you dropped by again! Wally and I are headed to Yuma later this month and will be checking out the dental services that you mention. Thanks for the article, exactly what we wanted to know. Happy New Year and perhaps we will see you on the road sometime. Happy New Year, Liz, and have fun in San Luis. We’ll keep an eye out for you on the road! Great timing on this post! I went to the dentist 2 weeks ago for my semi-annual checkup and I knew I had a broken tooth and he saw it, and told meI should have a crown…..$1050! I found out that my VA dental coverage pays nothing,so I ended up having it filled…..even though it was an old and weak tooth! I don’t have the bill yet! Oof!!! A fraction of that could get you a good porcelain crown, and a visit to Yuma/San Luis in the wintertime isn’t a bad thing. Chew carefully!!! This is an interesting and informative web site. Hello Mark & Emily. We’ve been following your blog for over a year without ever saying hello – greetings at last! We follow a few blogs: Wheeling It, Technomadia, Gone With The Wynns and the RV Geeks, and of course your blog. In large part based on the information you’ve provided, we purchased a used fifth-wheel last year and have hit the road. We’re currently in Arizona and have decided it’s time to use your advice to visit the dentist in Mexico. I am wringing my hands with anxiety, but fortunately my husband is more sanguine about this bold move. We hope to visit Yuma in the next few weeks and will follow your directions to the letter. We are installing a ‘baby’ solar system on our rig as well, and have found your experiences quite helpful. Thank you for sharing your knowledge with novice RVers and we hope to be able to meet you sometime! Thanks for the note, Terri. I appreciate your warm feedback. We’ve been pleased with our dentist’s work, but just like any dentist or other medical practitioner, if you are uncomfortable with their assessment and diagnosis, find someone else. Have fun south of the border, good luck with your solar project, and thanks for reading our blog. Dentures your bottom teeth are good and 8nportant to keep if you can. So he did the impression we left mexico we back to our room . Just want to say we stay at cocopah hotel and casino it was awesome beautiful rooms food was great love the pool stayed 2 nights !! We returned to mexico and sergio numbed my mouth really good no pain at all not even the shots he pulled 7 teeth I had a bridge for 12 years it finally broke so it was the next decision I couldnt afford emplantsafter he took all the teeth out clean my mouth good then put the dentures in wow they looked better than my own teeth he made them alittle white so nice I cried alillte happy tears we alway come to Sergio I dont know what will do when he retires ! I always call to make sure his in the office that week and tell him we are coming. I will not take my teeth out for atleast a month just rinsing with salt water with teeth in. I also picked some antibiotics and sergio wrote my a prescription for pain meds it help is 5 day feeling better ever day eating lots of soup and soft eggs. That’s a wonderful testament to the good work that Dr. Bernal does, Cynthia. 20 years is a long time to stay with the same dentist, and if your husband and many friends have gone to him too, that’s even more of a testimonial. I’m so glad to hear you’ve been happy with his work! Thank you for leaving your comment. I hope you recover quickly and can get back to yummy solid food soon!